"ROK Army", "ROKA", "South Korean army"
"A Strong Friend, Republic of Korea Army"
The Republic of Korea Army (ROKA; Korean: 대한민국 육군; Hanja: 大韓民國 陸軍; Revised Romanization: Daehanminguk Yuk-gun), also known as the ROK Army, is the army of South Korea, responsible for ground-based warfare. It is the largest of the military branches of the Republic of Korea Armed Forces with 464,000 members as of 2018. This size is maintained through conscription; South Korean men must complete 21 months of military service between the age of 18 and 35. The modern South Korean army traces its lineage back to the Gwangmu Reform, when the Beolgyegoon was established by Emperor Gojong in 1881. The 1st of every October is celebrated in South Korea as Armed Forces Day. It commemorates the day during the Korean War when units of the ROK Army first crossed the 38th Parallel, thus leading the UN Coalition north into North Korean territory for the first time. The National Security Guard Of South Korea was originally formed out of the Republic Of Korea Army. This organization was created during the American occupation period from 1945-1948. The National Security Guard Of South Korea was initially a reserve unit of the National Police. In addition to some Nationalist Chinese and post-Manchurian soldiers remnants of the Imperial Japanese Army also contributed to the force. The National Defense Force was established on January 15, 1946 replacing the American lead constabulary from 1945. The outbreak of the Korean War caught the South Korean forces unprepared, requiring the United Nations to intervene with U.S.-led forces. The South Korean military rapidly developed during the Korean War, suffering enormous casualties and loss of equipment. As the Soviets had armed North Korea, the United States armed and trained the South Korean military throughout the Korean War. The South Korean army is structured to operate in both the mountainous terrain native to the Korean Peninsula (70% mountainous) and in North Korea with its 950,000 strong Korean People's Army Ground Force, two-thirds of which is permanently garrisoned in the frontline near the DMZ. The current administration has initiated a program over the next two decades to design a purely domestic means of self-defense, whereby South Korea would be able to fully counter a North Korean attack. The ROK Army was formerly organized into 3 armies: the First Army (FROKA), Third Army (TROKA) and Second Operational Command. Each with its own headquarters, corps, and divisions. The Third Army was responsible for the defense of the capital as well as the western section of the DMZ. The First Army was responsible for the defense of the eastern section of the DMZ whereas the 2nd OC formed the rearguard. Under a restructuring plan aimed at reducing redundancy, the Second ROK Army was converted as the Second Operations Command in 2007, and the First and Third ROK Armies were merged as the Ground Operations Command in 2019. The army consists of 495,000 troops, approximately 2,400-2,500 tanks, 2,700 armored fighting vehicles, 5,800 artillery pieces, 60 guided missile systems, and 600 helicopters as of 2014. Main battle tank types include: 880 M48 Patton series and its upgrades such as M48A3K, M48A5, and M48A5K, 33 Soviet T-80U and 2 T-80UK (given by Russia to pay off debt), as well as 1,524 K1A1 and K1 tanks, which bear a 120 mm smoothbore gun and are of local manufacture. The future replacement for the K1 and K1A1 MBTs has been named the K2 Black Panther (흑표;黑豹 Heukpyo), which will be fitted with a 1500 hp MTU-based engine, 55-caliber 120 mm main gun with autoloader. The new tank will also feature radar equipment as well as all-bearing laser detection and defense systems, anti-missile active protection, and heavy reactive armor and sensor package comparable to the American M1A2 Abrams and German Leopard 2A6. The ROK Army is planning to field approximately 390 Black Panthers. 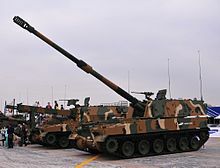 In addition Republic of Korea manufactures the K-9 howitzer which have been exported to Turkey as the T-155 howitzer as well as the ZMA series TIFV's which saw action in UN peacekeeping operations (PKO) as part of the Malaysian peacekeeping forces. A variation of the K200, the KAFVs can be retrofitted to bear a 90 mm cannon, 40 mm grenade turret, M230-1 Chain gun Turret, or MK-30 Chaingun Turret. A replacement for K200 series IFVs are currently being tested, designated as K21 KNIFV (Korea Next generation Infantry Fighting Vehicle), which will have various capabilities for both land and naval warfare. The initial production is set for 2008, with the ROKA planning to field approximately 1,000 units until 2015. The K21 KNIFV's chassis will be constructed entirely out of fiberglass, reducing the vehicle's load and enabling it to travel at higher speeds without bulky and powerful engines. When constructed, the NIFV will be lighter than other IFVs, including the American Bradley series and Russian BMP series, increasing both speed and payload. The ROK Army also fields the mobile K-SAM "Pegasus"(천마/天馬; Cheonma), fitted with 8 missiles that fly at maximum speeds of mach 2.6, and the K-30 "Biho" series, which features a 30 mm twin gun system for anti-aerial fire support. Besides having vehicles and equipment of their own design as well as American models, the ROK Army also possesses inventories of Russian-built AFVs, including BMP-3 IFVs and T-80U MBTs, given by the Russian government to pay off the financial debt owed to South Korea. Other notable foreign equipment in service with the ROK Army includes the Mistral MANPADS. A new infantry rifle, the Daewoo K11 entered service in 2010. 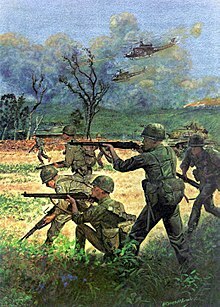 The overall concept of this weapon is similar to the American OICW. South Korean soldiers on a recon exercise in 2014. Officer ranks can be learned fairly easily if one sees the pattern. "So" (小) equals small; "Jung" (中) equals medium; "Dae" (大) equals large. "Jun" (准) equals equivalent, used for Warrant Officer and 1 star general to ensure that they are regarded as officer/general, although these ranks are lower than the same grade with "So" rank. "Won" (元) equals principal, only used for Won-Su, General of the Army. Each of these is coupled with "wi" (尉) equals company grade, "ryung" (領) equals field grade, and "jang" (將) equals general. NCO rank is same as officer. "Ha" (下) equals lower; "Jung" (中) equals medium; "Sang" (上) equals high; "Won" (元) equals principal, because this title is named after Won-Su, to ensure that this rank is higher than Sang-sa. Each of these is coupled with "Sa" (士) equals sergeant, although actual 'sergeant' rank is "Byeong-jang". This system is due to the hanja or Sino-Korean origin of the names. ¹: No one has yet held the rank of Won-su in the history of the ROK Armed Forces. ²: The Jun-wi (Warrant Officer)'s insignia is in gold color while the ones of Second Lieutenant and higher are in silver color. ^ "2018 Defence White Paper" (PDF). December 2018. ^ Choi, Dalhee; Kim, Dongjin (1949). "육군가" (in Korean). YouTube. Retrieved September 8, 2016. ^ Choi, Dal-hee; Kim, Dong-jin (1949). "육군가" (in Korean). YouTube. Retrieved September 8, 2016. ^ Choi, Dal-hee; Kim, Dong-jin (1949). "육군가". Retrieved March 21, 2017. ^ Klingner, Bruce. "South Korea: Taking the Right Steps to Defense Reform". The Heritage Foundation.